BigWater Adventures in Western Australia. Venice, Louisiana is known for its year-round fishery. The Bull Redfish bite is always on with Captain David Iverson. Catching grouper, snapper, cobia, and more out of Ocean Isle, NC. Plus, a big surprise for Mark Davis. 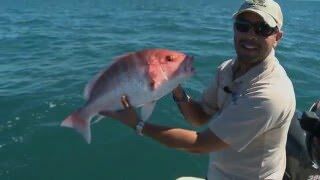 Inshore Action at Tropic Star Lodge in Panama. Offshore Tuna and More from Venice, Louisiana. Costa Rican Billfish at Crocodile Bay. Giant Bluefin Tuna in Prince Edward Island, Canada. 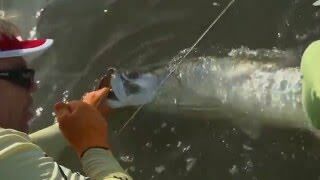 BigWater Adventures takes on Trinidad Tarpon. Offshore Action at Tropic Star Lodge in Panama. Premiering January, 2019 on Outdoor Channel. Captain Jamie Hough of the redfish mafia puts BigWater Adventures on a late-season trout bite. Captain David Iverson has a bull redfish pattern for every month of the year with impressive results. 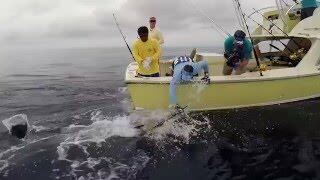 Topwater tuna action and Blue Marlin at Panama’s Tropic Star Lodge. Deep dropping and hand-cranking big fish in 1,000 feet of water with Mexican Gulf Fishing Company. Prince Edward Island, Canada is famous for producing giant bluefin tuna greather than 1,000 pounds. 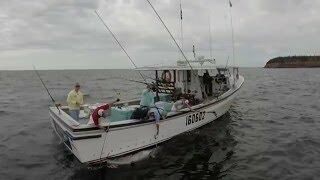 BigWater Adventures and the Bulls off Plaquemines Parish, LA. Costa Rica’s Crocodile Bay is taking steps to grow its billfish population, and it’s working. Bamm Bamm charters of Port Mansfield, TX catches red snapper offshore and speckled trout in the Lower Laguna Madre. Captain Greg Hildreth puts BigWater Adventures on a bull redfish bite in St. Simons Island, GA.
Catching scores of tarpon in Trinidad with Captain Jonathan de la Rosa of MonstaTarpon.com. Catching Yellowfin Tuna with the Mexican Gulf Fishing Company at the Deepwater Asgard drilling rig. Catching King Salmon on Alaska’s Kenai River and fishing three days at the remote Middleton Island. Deploying the first-ever satellite tag on a roosterfish in Panama. Crazy marlin, sailfish, wahoo, and tuna action at Tropic Star Lodge in Panama. Oriental, NC has some of the best bull redfish in the country. Charleston, SC redfish, speckled trout, sharks, and a study of redfish migration with The Redfish Mafia. Costa Rica’s Crocodile Bay Lodge is famous for its sailfish population and ecological diversity. Prince Edward Island, Canada is a Mecca for giant bluefin tuna with Bruce Brothers Charters. 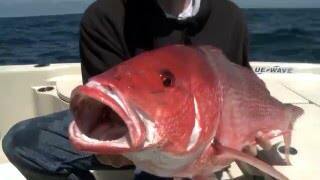 Snapper, Grouper, and Kingfish in Pensacola, Florida with Fish Happens Charters. 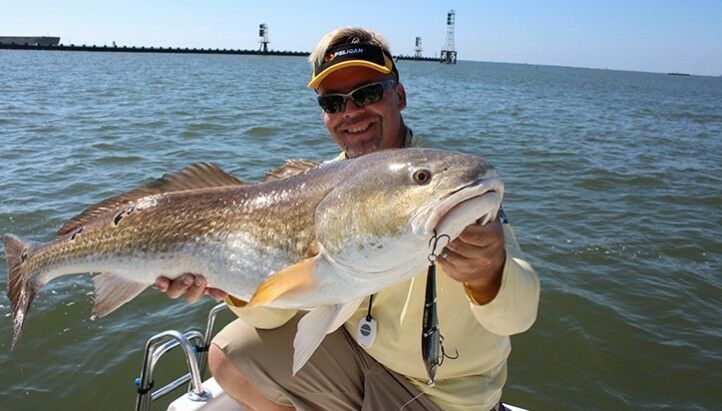 Venice, Louisiana is a year-round hot spot for bull redfish. An overnight trip to Alaska’s Montague Island yields monster halibut aboard the Tia Rose with Tim Berg’s Alaskan Fishing Adventures. Panama’s Tropic Star Lodge in July offers opportunities at lots of trophy gamefish including marlin, sailfish, roosterfish, cubera, and dorado. Cold-weather redfish from Charleston, SC. Offshore and inshore action from the FL panhandle. Red Snapper, Speepshead, and more. 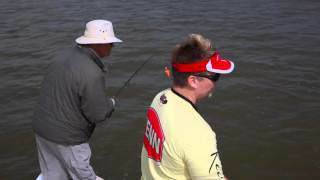 Chasing bull redfish in what can be called the world’s best redfish location, Venice, LA. 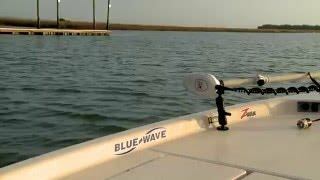 The south Texas coast offers many options inshore and offshore. Speckled trout, red snapper grouper, and much more. Celebrating 100 episodes of BigWater Adventures with Tropic Star Lodge in Panama. BigWater Adventures returns to the site of its very first episode to drop the hammer on grouper, Ajs, and more. BigWater Adventures’s friends catch giant bluefin tuna and the GBFT tradition is passed to another generation. It’s true. Georgia has an excellent Tarpon fishery. Rig-fishing the Gulf of Mexico for yellowfin tuna. Sight-fishing cobia and redfish just outside the nation’s capital. Tim Berg’s Alaskan Fishing Adventures never ceases to amaze. 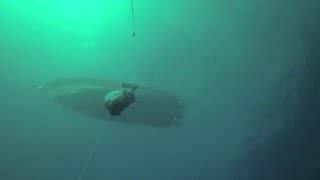 BWA takes an overnight trip to Montague Island to catch monster halibut. Mark Davis is heading out to the Lower Laguna Madre for big Speckled Trout. Mark Davis is in Montauk, New York fishing for big stripers and bluefish off the coast. 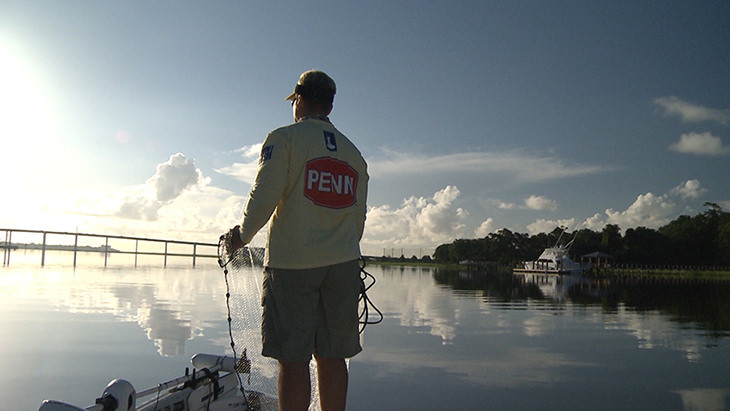 Mark Davis heads to Charleston, South Carolina to catch redfish on his Blue Wave. Mark Davis talks with the expert on Goliath Groupers and then heads out in his Blue Wave to hook one up and tag it for scientific research. Mark Davis heads out on his Blue Wave to catch big Speckled Trout along with several Redfish. Mark Davis is fishing out of Crocodile Bay Resort in Costa Rica for the annual Sailfish Migration. Mark Davis is in the bayou of Venice, Louisiana hooking up giant redfish on his Blue Wave. 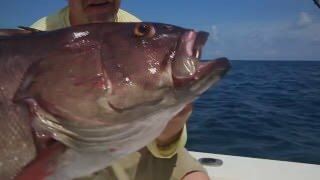 Mark Davis heads 130 miles offshore to the Middle Grounds fishing for big grouper and snapper. Mark Davis heads out on the Rudee Angler for some deep dropping action hooking up a Swordfish on a head boat and then heads inshore to catch the flounder bite. 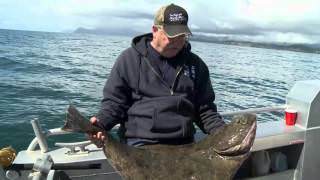 Mark Davis is fishing out of Seward, Alaska for big Ling Cod, Halibut, and several other crazy looking species! Mark Davis Heads inshore for Wahoo at Tropic Star Lodge and then heads off shore for some Bull Dolphin action! 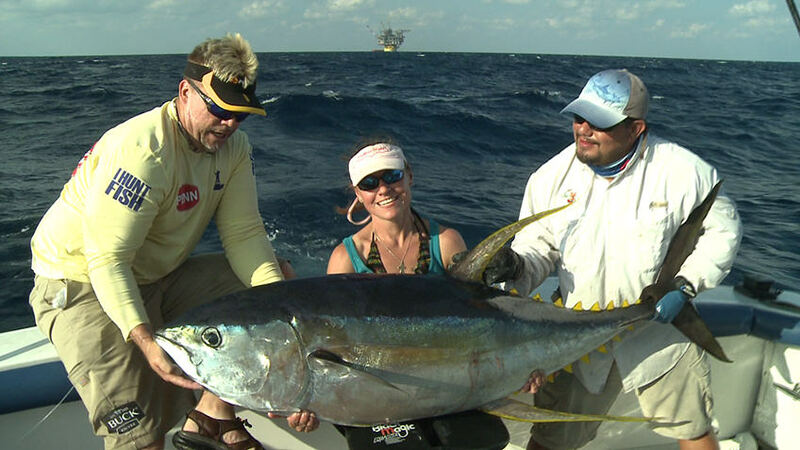 Mark Davis is at Tropic Star Lodge hooking up big yellowfin tuna on topwater during a tuna frenzy!